Jordan Hamilton shoots a jumper. The sophomore guard scored 20 points at DePaul. The old adage that “history repeats itself” proved itself to be true yet again Wednesday at McGrath-Phillips Arena in Chicago. 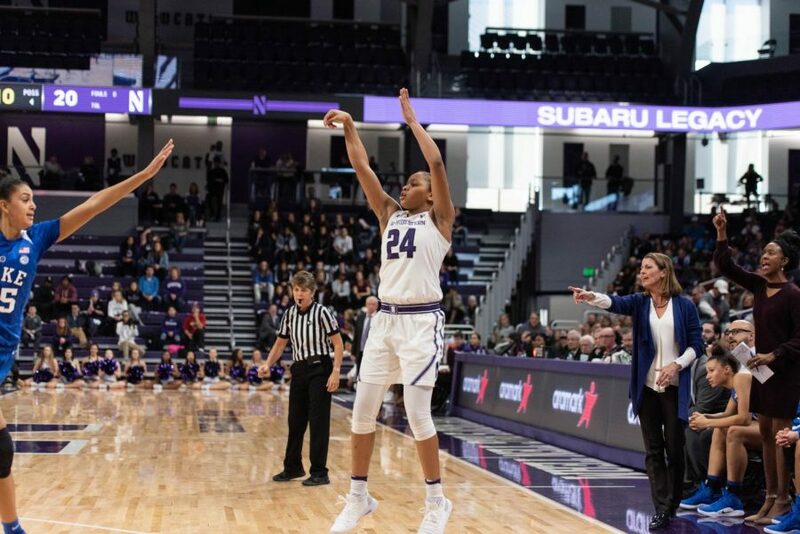 Last December, Northwestern jumped out to an 18-point lead in the first quarter against DePaul at Beardsley Gym, but ended up losing the game by a monstrous 29 points. In this season’s matchup between the two crosstown rivals, a similar storyline revealed itself. The Wildcats (5-2) led the No. 20 Blue Demons (6-3) by 16 points at the end of the first quarter, but by the end of the game, the hosts were the ones up by 16 as DePaul won 76-60. Despite star senior forward Pallas Kunaiyi-Akpanah having to be subbed out after 29 seconds and not return for the rest of the game due to an injury, the Wildcats played some of their best basketball in the first quarter. Even without Kunaiyi-Akpanah, NU scored 20 points in the paint, shot 15-for-19 from the field and led 32-16 after the first 10 minutes. But, the second quarter was a different story. Only one of 13 shots went through the net — a three-pointer from sophomore guard Jordan Hamilton with under three minutes to play in the quarter — and not one player earned a free-throw. NU barely got to the line at all, taking only four free-throws the entire game and making only one. While the Cats were throwing up bricks, DePaul was working its way back into the game. The team only shot 40 percent from the field during the quarter, but hit four three-pointers to turn the 16-point deficit into a two-point one at halftime. In the second half, the Blue Demons continued to have control of the game and went into the fourth quarter up two points. In that final frame, DePaul ran away with the game, outscoring the Cats by 14 points and shooting 71 percent from the floor. On the flipside, NU had its second-best shooting quarter of the game, but it was not enough to keep up with the Blue Demons. Hamilton led the way for the Cats with a season-high 20 points on 8-for-16 shooting, including 4-for-7 from beyond the three-point arc. The Texas native also dished out a game-high five assists. A key difference in the game was points off turnovers. While NU was able to score 10 points off turnovers, the Blue Demons had 27 points coming after an NU turnover. This included nine in the second quarter and 14 in the fourth. DePaul also had 21 fast-break points, including 10 in the final frame. Junior forward Abi Scheid did return to acton against the Blue Demons after missing the previous two games with an injury. In her return, Scheid played 26 minutes but was only 3-for-11 from the field. Now, NU has to turn its attention to another ranked team — No. 18 Marquette. The Golden Eagles will visit Welsh-Ryan Arena on Sunday for the Cats’ final matchup before taking a week off from games due to finals week. Like NU, Marquette will enter Sunday’s game coming off of a road loss to a ranked team. The Golden Eagles travelled to Starkville, Mississippi to battle No. 6 Mississippi State on Thursday. Chicago native Danielle King dropped 27 points for Marquette while shooting 62 percent. Allazia Blockton, the team’s leading scorer, added 17 points on 7-for-11 shooting.